The airmail stamp of Italian Post is a rarity in the philatelic world with only five examples known. This stamp was issued to commemorate the planned flight from Bucharest to Paris in Constantinople. Nearly all the examples of this stamp were destroyed due to the closure of all Foreign Post Offices within Turkey. 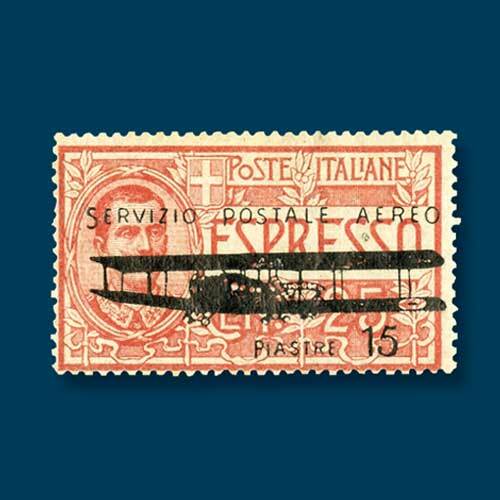 This stamp consists of an overprint of ‘Servizio Postale Aereo’ with denomination 15 piasters, but the base stamp design is the 25 centesimos special delivery stamp issued in 1903. This stamp was sold for nearly 70,000 dollars.